This is Herb's most popular book on Java, fully updated and expanded to cover Java SE 11 (JDK 11). Whether you're an experienced pro or just starting out, this one-stop guide will help you master this important language. Inside you'll find comprehensive coverage of the Java language, its keywords, syntax, and fundamental programming principles. Of course, the very important modules feature is described in detail. This lasting resource also describes key elements of the Java API library, such as the Collections Framework, concurrency, servlets, beans, event handling, AWT, Swing, and more. As an added bonus, an introduction to JShell, Java's interactive programming tool, is included. This is Herb's step-by-step introduction to Java, updated for Java SE 11 (JDK 11). If you are just learning Java, then this is the book for you. It starts at the beginning, explaining the history of Java and why it's important. You then learn how to obtain the Java Development Kit (JDK) and write your first Java program. Next, it's on to the Java fundamentals, including data types, operators, control statements, classes, objects, and methods. You'll then progress to more advanced topics, such as inheritance, exception handling, the I/O system, and multithreading. Also included is coverage of some of Java's most powerful features, such as generics, lambda expressions, and the very important modules feature. An introduction to Swing is.also included. As an added bonus, an introduction to JShell, Java's interactive programming tool, is included. This is Herb's fast-paced, practical introduction to JavaFX 8 GUI programming. JavaFX is Java's next-generation GUI programming framework. The book begins with the fundamentals, including the general form of a JavaFX program. You then advance to event handling, controls, images, fonts, layouts, effects, transforms, animation, menus, and more. Numerous complete examples are included that put key topics and techniques into action. Designed for Java programmers, the book's focus is on the JavaFX API and all examples are written entirely in Java. 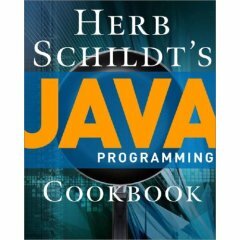 For years, friends and readers have been asking Herb to write a cookbook on Java. Finally, he did! Based on the well-known "cookbook" format, each "recipe" shows how to accomplish a practical programming task. Organized for quick reference, a recipe begins with a list of key ingredients (classes, methods, and interfaces) followed by step-by-step instructions that show how to assemble them into a complete solution. Detailed discussions explain the "how and why" behind each step. A full code example puts the recipe into action. Each recipe ends with options and alternatives that suggest ways to adapt it to fit a variety of situations. Here is a sample from the book that shows the recipe format. Immediately after finishing his Java cookbook, Herb moved on to C++. The result is Herb's C++ Programming Cookbook. Based on the same well-known "cookbook" format as his Java Programming Cookbook, each "recipe" shows how to accomplish a practical programming task. Organized for quick reference, a recipe begins with a list of key ingredients (classes, functions, and headers) followed by step-by-step instructions that show how to assemble them into a complete solution. Detailed discussions explain the "how and why" behind each step. A full code example puts the recipe into action. Each recipe ends with options and alternatives that suggest ways to adapt it to fit a variety of situations. Java Programming: A Comprehensive Introduction, co-authored with Dale Skrien. It is part of McGraw-Hill's College Programming Series. All rights reserved worldwide. No duplication allowed without prior written permission.